This week we have a great question from Danielle — she’s about to change careers, but she’s not exactly sure how or to what. 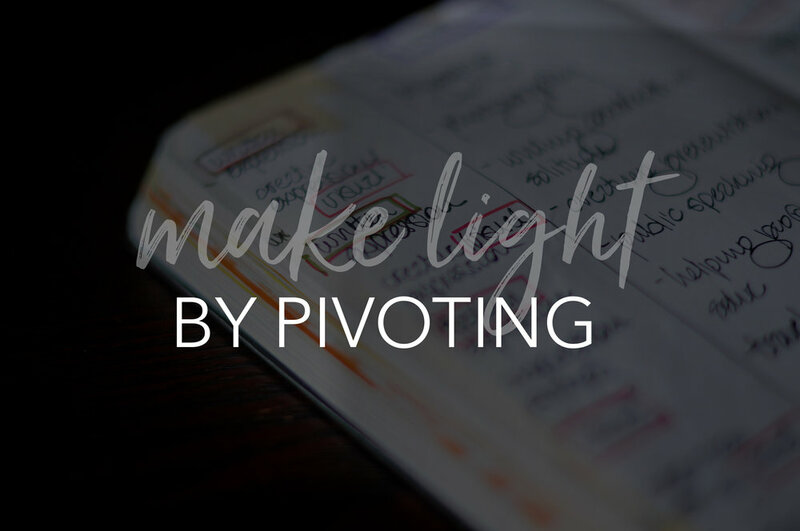 Take a listen as I talk about how I handled the very same situation, including three journaling prompts to help you make a pivot of your own. Click here or the arrow below to listen, and check out the show notes for more about this episode. 2) subscribe on iTunes, Android, or wherever you listen to your podcasts -- and if you're enjoying the show, be sure to leave a review! My friend Mira and I talked about race. And we went in. Why striving for happiness might just save the world. Do your goals have purpose? Are they clear? Have you ever mapped them out? Join me today to here how I do all these things — and maximize my goals’ success. Does your workspace reflect your values? Here’s how to make that happen. A few weeks ago, I talked about why it’s important to follow your curiosity. Here’s how to do it. Join me today as I share my 5 tips to quitting your job in the most positive way possible. My sweet, empathetic friend Indrani Goradia shares how coming in dead last in a triathlon was the first step in her journey to changing the world. Resilience might be the key to living. Here’s how I cultivate it. Today (and many days) I tackle impostor syndrome. Join me to find out how. I had a transformational experience in Stasia Savasuk’s Style School.